After arriving early yesterday in London, Margaret and I spent a short time figuring out a few transportation details and made our way to Covent Garden to see the impressive new 3-story Apple/Mac store and to check our email. Most people would probably head for a more famous and historical destination like the Tower of London, but with a week of exploration before us we thought a quick email check and Facebook update (mine) was the thing to do first. We had an impromptu photo shoot outside the store later after noting a few things inside that we both coveted. She took this creative snap of me on her new ( the very latest ) iPhone which is way cooler than the antique one (the first one released) that I still use. She has a cool app that can make images look a variety of ways and I chose one that made my photograph look old and a bit dated which seemed appropriate for a place where people have gathered for hundreds of years. Of course, I mean Covent Garden silly … not the Mac store. 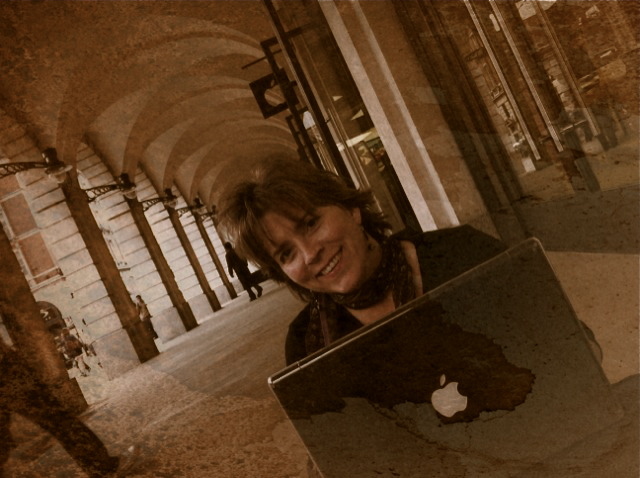 So there I am with my Macbook in hand, coming to you almost live from London. A quick note before we begin our adventures for today, I am able to check in from time to time so please leave a message or comment if you’d like especially with any last minute things we should not miss on our trip. I printed out all of your suggestions from this previous post and have it with me now. Thanks again to each of you who took time to share some of your own London experiences and I want to add that do I intend to respond (after London) to the very kind comments you have been leaving me over the last few days especially those from this tender post. I’ll be back later tomorrow with Day Four in the countdown towards my big birthday and likely some stories about today.